Your input is a very important part of developing next step actions for wildfire risk reduction on Molokaʻi. You are invited to the Molokaʻi Vegetative Fuels Management Collaborative Action Planning and Mapping Workshop on April 2 hosted by Hawaii Wildfire Management Organization and partners. When: April 2, 8 a.m. - 2 p.m.
Join the broader community of Molokaʻi professionals dealing with wildfire threats and impacts for a facilitated conversation about next step hazard reduction priorities and projects. Marking priority areas for fuels treatments. Check out the results of recent efforts to map current management of hazardous vegetative fuels (thanks to all of the information that partners contributed, thus far). Identify and discuss shared regional fuels management priorities and projects to mitigate the risks of wildfire across our island landscapes through a facilitated series of small and large group conversations. Your knowledge and priorities will contribute to planning next steps in the ongoing collaboration to manage vegetative fuels to reduce wildfire and protect both our communities and natural resources. Add to the map of current and desired hazardous vegetative fuels management projects. 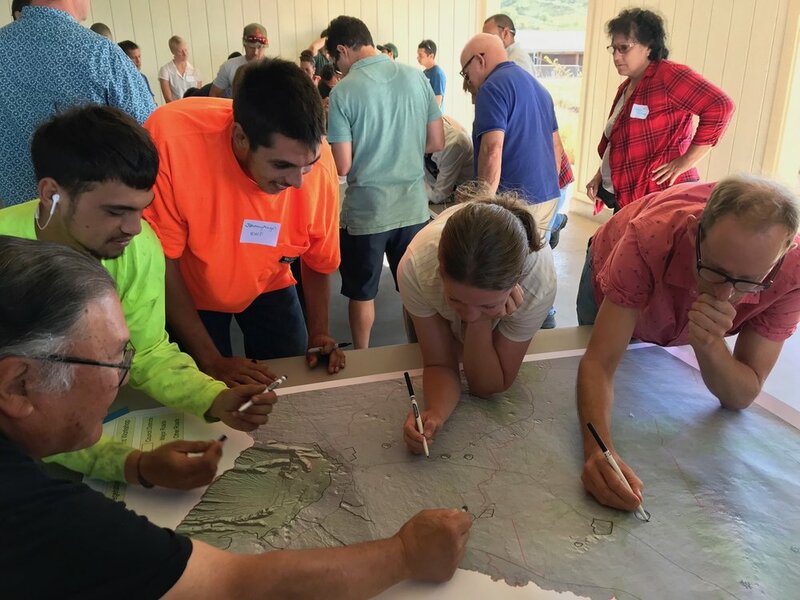 Workshop attendee(s) should be those who are familiar with delineating the locations of vegetation management activities (fuel/firebreaks, shaded/living fuelbreaks, grazing, thinning, invasive removal, native restoration, etc.) and their associated details (type of work being done, frequency of activity, etc.). We hope you can meet us there and contribute to this valuable and landmark effort for wildfire protection planning! If you have further questions or concerns, contact Pablo Akira Beimler: e-mail pablo@hawaiiwildfire.org or Lele Kimball: lele@hawaiiwildfire.org or call (808) 885-0900. “Councilmember Ron Menor and the Office of Climate Change, Sustainability and Resiliency invite you to the Climate Action Plan Public Meeting Series (Central O‘ahu) on Wednesday, December 12, 7:00pm at the Mililani High School Cafeteria. Hurricane Lane and Olivia show that climate change is already having profound impacts on O‘ahu and we need to chart a new path. What is your vision for a resilient, fossil fuel free future for our island? We invite you to learn about O‘ahu's first climate action plan, engage in a "game" that helps kick-start a discussion about how best to cut our emissions, and chart the next steps for our island. “Council Chair Ernie Martin and the Office of Climate Change, Sustainability and Resiliency invite you to the Climate Action Plan Public Meeting Series (North Shore) on Thursday, November 8, 7:00pm at the Waialua Elementary School Cafeteria. Hurricane Lane and Olivia show that climate change is already having profound impacts on Oahu and we need to chart a new path. We invite you to learn about Oahu's first climate action plan, engage in a "game" that helps kick-start a discussion about how best to cut our emissions, and chart the next steps for our island. “Councilmembers Carol Fukunaga & Ann Kobayashi and the Office of Climate Change, Sustainability and Resiliency invite you to the Climate Action Plan Public Meeting Series (Blaisdell) on Monday, October 29, 6:00pm at the Neal S. Blaisdell Center, Hawaii Suites. “Councilmember Trevor Ozawa and the Office of Climate Change, Sustainability and Resiliency invite you to the Climate Action Plan Public Meeting Series (East Honolulu) on Wednesday, October 17, 7:00pm at the Hawaii Kai Public Library. Hurricanes Lane and Olivia show that climate change is already having profound impacts on Oahu and we need to chart a new path. Aerial imagery of the 2018 Waikoloa Fire. The Waikoloa Village Association (WVA) Fire Management Action Committee is hosting a Community Firewise Forum on Thursday, September 27, 2018 at Waikoloa School starting at 5:30 PM. We will share lessons learned from the August fire that burned over 18,000 acres in Waikoloa: what worked, what did not and what could be improved upon. In addition, ample time will be provided for audience questions and answers. The recent fire will go down as the 2nd largest in Hawaii's modern history, falling short of the 25,000 acre fire in 2005 that burned to the very edge of Waikoloa Village, forcing evacuation of 75 % of the town's 6,500 residents. Coincidentally, the 2005 fire was also August 1st, 18 years to date, of our most recent fire. Waikoloa Village, with HWMO’s assistance, has been a nationally-recognized Firewise Community since 2016, one of eight on Hawaii Island. The Firewise Communities Recognition Program is a nationwide program that recognizes communities for their efforts towards reducing the loss of lives, properties, and resources to wildfire. The Firewise Communities approach emphasizes ongoing and active community involvement in wildfire safety. This meeting is an opportunity to join Waikoloa Village’s grassroots, collaborative effort to protect the community from the growing wildfire threats in the area. Hear from HWMO and Civil Defense, HFD, CERT, PTA and other agencies and organizations at a roundtable event to discuss the recent Waikoloa Fire that burned over 18,000 acres. Also, learn to how to prepare yourself and your homes for future wildfires, hurricanes and other disasters. If you have suggestions, questions or comments for the Waikoloa Village Fire Management Committee, feel free to contact the Chair Mark Gordon at mgordon333@outlook.com. The University of Hawaii Sea Grant College Program invites you to a community showcase of their Waiulaula Stream Restoration Project. Come to learn about their efforts to control erosion and polluted runoff at three sites in Waimea and enjoy some light pupus and beverages. 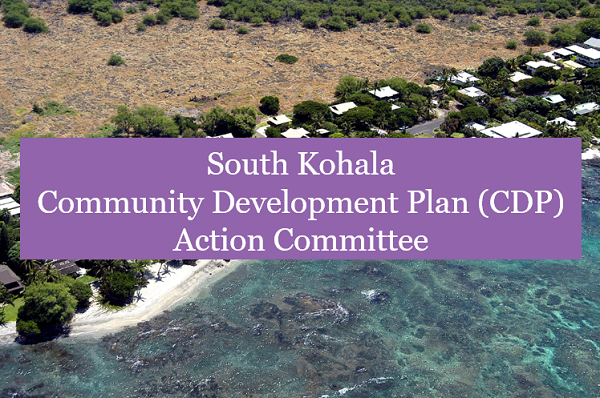 The next South Kohala Community Development Plan (CDP) Action Committee meeting is June 4 from 5-7p at the Lily Yoshimatsu Senior Center (Waimea Senior Center). You can play an active role in determining what the South Kohala Community looks like and the priorities you would like to see addressed (for example, better access for firefighters or buffer zones around communities or Firewise development practices) by participating in these meetings. "Hawaii County Civil Defense is offering Community Emergency Response Team training for East Hawaii residents, which includes modules on emergency preparedness, emergency medical response, fire, light search and rescue, and more. Training times and dates are 8:30 a.m.-4:30 p.m. Jan. 20 and 27 and Feb. 3 and 10 at Aupuni Conference Center. The course is free. CERT training provides you with knowledge and skills to prepare for and properly respond to an emergency impacting you, your family and the community. The Aupuni Conference Room is located at 101 Pauahi St.
For more information, visit www.citizencorps.gov/cert. To reserve a space in the class, contact hawaiicert@gmail.com." Ala Kahakai Trail Association is doing important work to restore and maintain historical trails in South Kohala and beyond. Their trail work also helps to prevent wildfires by managing invasive species, planting native plants, and installing informational signage. We hope you can join other interested community members for this October 7th meeting in Waikoloa! Learn about the Ala Kahakai Trail Association, the history and management of the Ala Kahakai National Historic Trail, and more at a community meeting this Saturday, September 16 at the Hokuloa Church in Puako from 3-5 p.m. "Your ideas about how the Trail can better benefit the community" are welcome. Contact Christopher Hawkins, ATA Coordinator with any questions at Hawkins@alakahakaitrail.org or (808) 494-7116. HWMO will be a guest speaker at the town hall meeting to share insight on the wildfire issues of Hawaii Kai and to provide action steps for homeowners and residents in the area. "As of late our community is in the process of unfortunately experiencing an outbreak of fires and malicious vandalism in some areas of Hawaii Kai. In order to combat this totally unacceptable behavior, while at the same time bringing our community together, a town hall meeting is slated for June 6th at 7pm at Hahaione Elementary and you might have already seen this announcement on the KITV 6 O'clock News last evening. "In recent weeks we have witnessed far too many fires in our community. As we approach summer the risk of property damage or loss of life is increasing. We are bringing in experts from Hawaii Wildfire Management Organization who have helped many communities on the Big Island mitigate their risk to fire damage. Help us plan and prepare our community to prevent the next wildfire. Sponsored by: Councilmember Trevor Ozawa, Stanley Chang, Senator Laura Thielen, Representative Gene Ward." "Oʻahu landowners are invited to attend a Landowner Acquisition and Easement workshop on Saturday June 3, 2017 from 9 a.m. to 3 p.m. at Palehua Ranch in Honouliuli. Coordinated by West O‘ahu Soil and Water Conservation District (SWCD), HILT, and the Department of Land and Natural Resources, Division of Forestry and Wildlife, the workshop brings together a group of landowners, land managers, and resource experts to provide insights on the successes, challenges and opportunities of legacy planning, acquisitions and easements. Hawaiian Islands Land Trust (HILT) board member McD Philpotts will highlight the efforts taken to conserve, manage, and restore the nearly 3,000-acre estate to preserve the natural and cultural resources of Hawai‘i. Following a short hike exploring the site’s natural and cultural features, community non-governmental and governmental partners will introduce participants to strategies for land legacy planning. 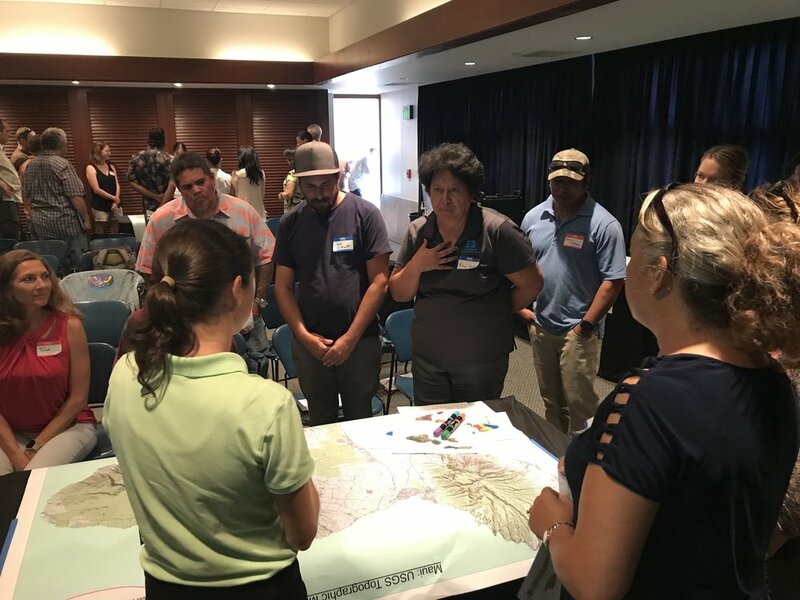 “This is a great opportunity for landowners, farmers, and ranchers, here in Hawaii to learn about a variety of conservation options available to them and the financial benefits and incentives available to protect their lands and natural resources,” said Kawika Burgess, CEO of the Hawaiian Islands Land Trust. Both workshops are limited to 30 persons, cost $15, and include lunch and coffee. For more information, contact: Michelle@WestOahuSWCD.org or 808.729.1676"
Presenters: University of Hawaiʻi Hilo Dr. Tracy Wiegner and Dr. Steven Colbert - Watershed sampling, connectivity between various wastewater technologies and the shoreline, and updates regarding neighboring resorts. Dr. Courtney Couch, Hawai‘i Institute of Marine Biology / The Nature Conservancy - Update on microbial source tracking that looks for the presence of human-specific gut bacteria in coastal waters. Potluck: Bring a dish to share as we talk story and enjoy a potluck following the presentations." "This will be a quarterly meeting to update the Puʻuwaʻawaʻa Advisory Council (PAC) on the current education, research, and management efforts in the Puʻuwaʻawaʻa ahupuaʻa, and to solicit advice and expertise on proposed management actions. Meetings are open to the public and in 2017 they are all on Friday afternoons from 3-5 PM at the Pu'uwa'awa'a Forest Reserve Lake House. The public is encouraged to attend and participate in all PAC meetings, subcommittee meetings, and activities. INTRODUCTIONS: 3:00 – 3:10 PM: Introductions of Pu`uwa`awa`a Advisory Council (PAC) members, agency staff, and visiting members of the public. Attendance sheet will be sent around. Meetings for the remainder of 2017, as decided at the last PAC meeting, are on August 25, and November 17. All meetings are Friday afternoons, 3-5 PM at Pu`uwa`awa`a Forest Reserve in North Kona, at the Lake House. MINUTES: 3:10 – 3:15 PM: Discussion and vote to amend and/or approve Meeting Minutes from previous PAC meetings as needed. NAHELEHELE PROJECT: 3:30 – 3:45 PM: “Ka'ahahui 'O Ka Nāhelehele’s mission is to advocate for the perpetuation of Hawaii’s dryland ecosystems, and the many often endangered plants, birds and insects that live within these communities” (from www.drylandforest.org). They will share about a project in its early phases. DRAFT RECREATION PLAN & NON-PROFIT QUESTIONS LETTER: 3:45 – 4:30 PM: The REV Subcommittee will present their updated Draft Recreation Management Plan and questions related to non-profit partnerships with DLNR to the PAC for discussion and/or approval to recommend it to DOFAW. PWW UPDATE, SUBCOMMITTEE UPDATES, AND OTHER PAC BUSINESS: 4:30-5:00 PM: Pu`uwa`awa`a Management Update, Grazing Management Plan update, as well as updates from other subcommittees, or other PAC business as needed. Time for questions, comments, or requests for future agenda items from the PAC and community. Contact Elliott Parsons; elliott.w.parsons@hawaii.gov, 808-333-0084 for questions and directions." If you haven't heard, Waikoloa Village is on pace to become the largest nationally-recognized Firewise Community in Hawaii! To qualify for 2016, the Waikoloa Fire Management Action Committee is hosting a Firewise Forum on Thursday, December 8th 5:30-7:00 p.m. at WVA Conference Room (68-1792 Melia St), to invite residents to discuss and participate in Waikoloa's Firewise efforts. HWMO will give a presentation about Waikoloa-specific wildfire hazards and recommendations as noted during a recent wildfire hazard assessment with local firefighting agencies. There will be time for Q&A discussion towards the end. Pupus and refreshments will be provided. Waimea Community Association will play host to the Non-Partisan Candidate Forum to spotlight three key races in the August 13 Primary Election: Hawaii County Mayor, County Council (Districts 1 & 9), and State House District 7. HWMO will be a co-sponsor of the educational event and will have an informational booth to share our great informational guides and keiki giveaways. The new campus at Palamanui has a number of exciting projects and events coming up. We are particularly excited about the Community Landscaping Project - a community approach to designing a vibrant, culturally-significant landscape in and around the campus. We will be working the HCC to share our knowledge on Firewise landscaping, which the project will include. Hawaii Wildfire Management Organization will be holding an informational booth outside of this year's Waikoloa Village Association Annual Meeting at the Waikoloa Elementary School. The Waikoloa Wildfire Action Team will be meeting to share before and after photos of personal action steps taken to protect the home and family from wildfire and will discuss next steps for the team. The Hawaii Wildfire Management Organization, in collaboration with Kauai Fire Department, Department of Land and Natural Resources Division of Forestry and Wildlife, and Kauai Civil Defense Agency agencies, will hold community input meetings to develop a Kauai Community Wildfire Protection Plan (CWPP).